August 30, 2018 - Like us now! 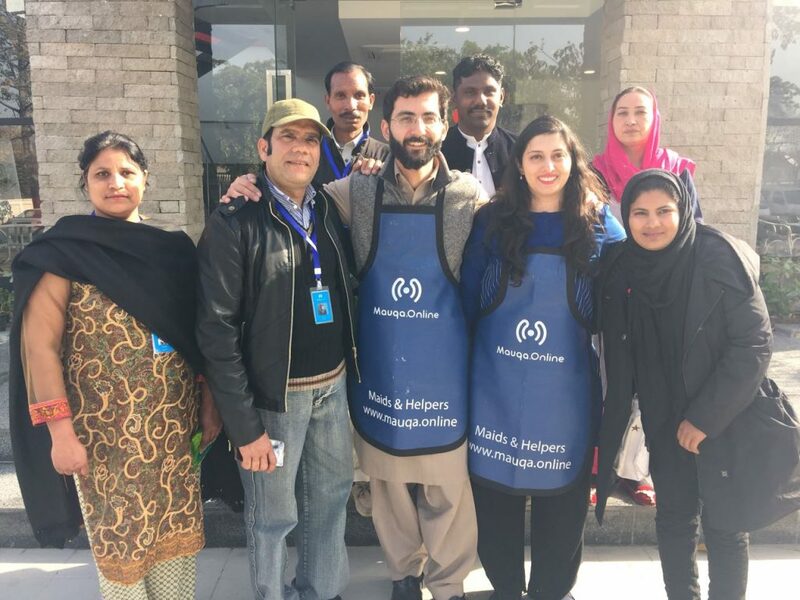 Working towards uplifting the uneducated who cannot access the internet for economic opportunities, a husband-wife duo in Islamabad has kickstarted Mauqa.online. Mauqa.online is an impact based startup providing an on-demand service that matches temporary workers to household help in Islamabad. The service has been gaining a lot of traction lately and the startup is now planning to scale across major cities of Pakistan. The startup is co-founded by Suniya Saadullah, an aspiring aerospace engineer along with her husband, Muhammad Mustafa who is a Stanford Graduate with a decade-long experience in the local telecom industry. Working in the Data Team of Jazz, Mustafa observed the lack of campaigns or tools that could encourage the use of the internet for finding better education or income opportunities amongst the financially disadvantaged. Broadband and mobile internet penetration may have increased, but the use of technology remains to be limited to entertainment for the uneducated masses. When Mauqa was kickstarted, the helpers were not interested in a tool or an interface but a chance to increase the likelihood of a better economic opportunity. Here Mustafa realized that technology is not about building apps and tools, but ensuring that a process requires minimum manual intervention. So how did Mauqa pivot to address the needs of these helpers? The startup launched a training program for individuals who did not have any formal education and had never been to school but had an appetite for skill-based learning for household help. The training combined technical and soft skills. Initially, the co-founders thought that generating a demand for such an idea will be a behemoth task. However, they were surprised to see how the service was well received. The challenge now was to sign up enough helpers to meet the demand. Focusing on household help at the moment, Mauqa provides nannies, maids and home cooks. The startup has completed over 6000 hours of service in six months and increased from six helpers to seventeen without any unpleasant incident. Mauqa has also partnered up with various local players of the ecosystem to improve their service. The startup has outsourced its logistics to Careem and partnered with Bykea and FINCA for cash collection and payroll processing. The startup was also thinking to outsource its training module, but after working at a grassroots level, they realized that in the years to come their training will be a differentiating aspect for Mauqa. As a part of the previous cohort of Invest2Innovate (i2i) Accelerator, Mauqa built upon the mentorship and training provided to them to grow their idea and expand their operations within the city. They are now focused on recruiting 100 helpers by the end of this year to meet future demand growth. i2i Accelerator is a startup acceleration program that provides business support to impact based startups with a proven curriculum focused on lean startup methodology. The program has been running since 2012 and has also been featured as one of the top 20 accelerators in Asia by Gust, an angel investor network. The accelerator program is currently accepting applications for their seventh cohort that will span over six weekends between October 2018 and February 2019. The shortlisted startups will get access to mentors and investors from across Pakistan and a virtual CFO who will work with teams to get them investment ready. The accelerator may also offer investments itself through i2i Ventures, i2i’s new seed capital fund. The program covers all travel and accommodations expense incurred during the program weekends that will take place in Karachi, Lahore, Islamabad, Murree, and Bhurban. Candidates working on innovative startups can apply here by August 31st.